Some of our Romeos have got in touch with us to find out how to use our recently updated iOS App. So, we’ve put together a mini FAQ below to help you guys along. The instructions below are in English, but if you’re using the App in German, French, Italian or Spanish, the instructions are the same, only the wording in the App will be in each of the respective languages. 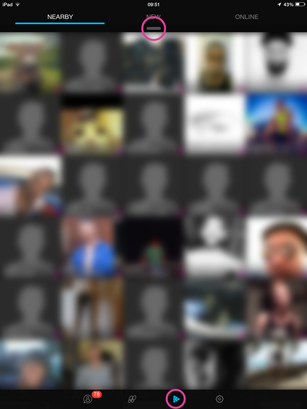 How do I search a profile name? 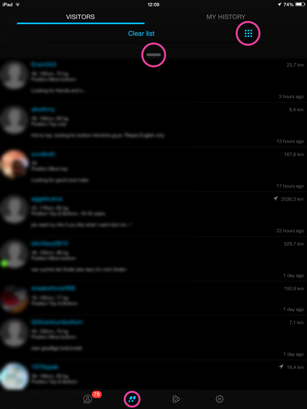 Tap the RADAR icon (third from the left at the bottom of the screen.) At the top of the screen in the middle you will see a little grey stripe under the word NEW; swipe that down then tap in the “Search for Username” box, then type the username you want to search for. When you’re finished tap “Done” to return to the main screen. You can also narrow your search to your chat buddies or contacts simply by doing the same as above in the CHATS or CONTACTS screen. Where are the filters hiding? You can find your saved filters or create new ones once again by tapping the RADAR icon and pulling down the grey stripe (as above.) 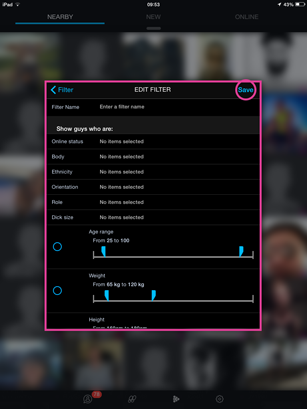 Tap “No Filter” if no filter is active or tap the active filter name (next to the little funnel icon) and select one of your other saved filters. 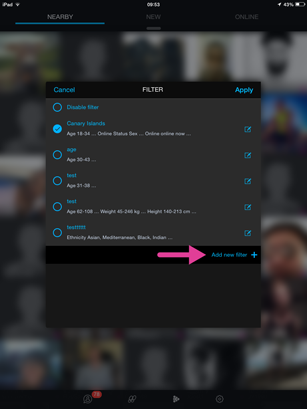 Tap “Add new filter” to create a new one, then choose your new search criteria. 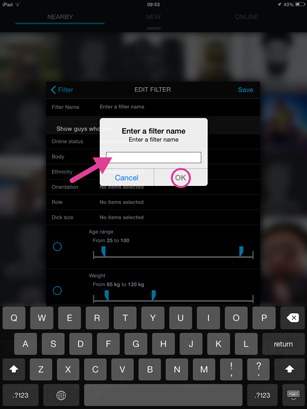 Save your new filter by tapping “Save” then give your new filter a name then tap “OK”. How do I switch between Online and All users when searching? From the RADAR screen pull down the grey stripe in the top middle of the screen, then tap “Online users” – if it’s green you’re searching online users, if it’s not, it’s all users. 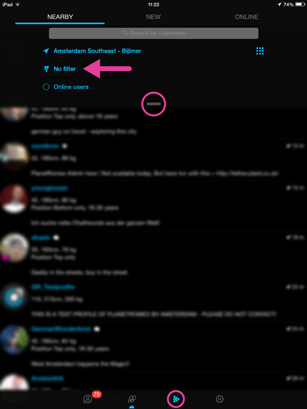 How do I clear my Visitors or My History list? Go to the Visitors screen by tapping the shoes icon (second from the left at the bottom of the screen.) 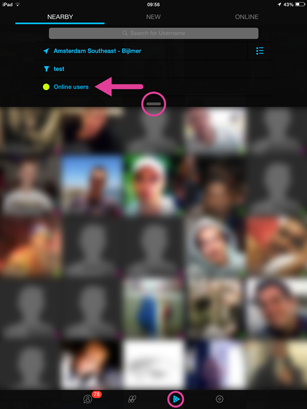 Pull down the grey stripe at the top middle of the screen, then tap “Clear list”. Make sure you’re on the right list before you clear it! Please note: MY HISTORY will be called VISITED in the future. 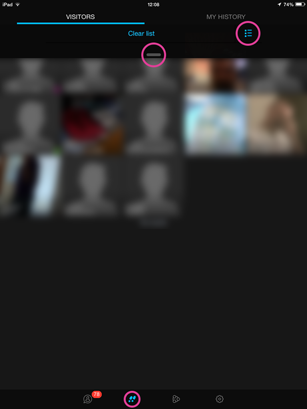 How do I switch from GRID VIEW to LIST VIEW? From either the Visitors/Visited screen or the RADAR screen, pull down the grey stripe located at the top middle of the screen then to the right you will either see 9 dots in a square formation or 3 dots with lines. 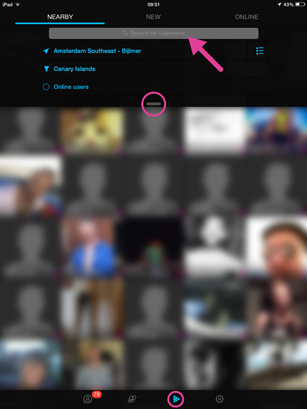 Tap either of these icons to toggle back and forth between grid or list view. Well that pretty much covers the most frequently asked questions about some common functions. Give them all a try!